Plumbing issues range in severity from “mildly annoying” to “emergency repairs required.” Some may start as one and end up as the other. It’s a good idea to familiarize yourself with the various problems that can lead to repiping, so that you can have them repaired before they have the chance to cause any more damage. The following are some of the more common plumbing issues that lead to repiping, and the warning signs that you need to look for with them. Corrosion is a common problem for plumbing pipes of all kinds. 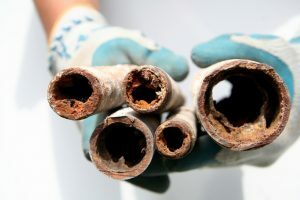 Though copper pipes have largely replaced iron pipes due to their immunity to rust, they can still become corroded over time if exposed to formaldehyde and chlorine particles. Corrosion is difficult to notice without professional inspection and maintenance services. Most often corrosion is noticed after it opens leaks in the pipes. Most common symptoms of leaks include dropping water pressure, high monthly water bills, and signs of visible water damage. Most of the time, corrosion spots can be patched without having to replace the entire pipe. If the pipe is old and corroded enough, though, it’s probably better to replace it. Limescale is the result of long term exposure to hard water, which is water with a high amount of magnesium and calcium in it. Limescale restricts the flow of water through the pipes over time, reducing the efficiency of the system. The bigger issue, though, is that limescale will harden if it is not dealt with in time. Once that happens, it will be nearly impossible to remove without damaging the pipe. Fortunately, it’s fairly easy to tell whether or not you have limescale between maintenance appointments. Look in any area that is often exposed to water from your plumbing system, like your bathtub or sinks, for a white, chalky substance. If you see that, it’s limescale. If you have limescale in those areas, you almost certainly have it in your pipes. You should call for repairs as soon as you notice this symptom. Of course, there are just a couple of the more serious problems that can result in having to repipe large sections of your plumbing system. The best way to avoid having this happen is to have your pipes checked out on an annual basis. If you do notice your plumbing system behaving suspiciously at all between appointments, it’s a good idea to call for repairs just to be sure. The longer you wait after noticing something odd with your plumbing system, the worse the problem is likely to get. Prompt repair calls can save you a lot of money in the long run, if you’re sure to react as quickly as possible. Admiral Plumbing Services, LLC offers a full range of plumbing services in West Palm Beach, FL. If you need part of your home repiped, or need plumbing services of any kind, contact us today to schedule an appointment with one of our expert plumbers. We’ll make sure that you get the best plumbing solution for your needs.